The Super Slim Stamp 2564 has a maximum text plate size of 7/8" x 2-3/8" allowing you to create up to 4 lines of customized text. 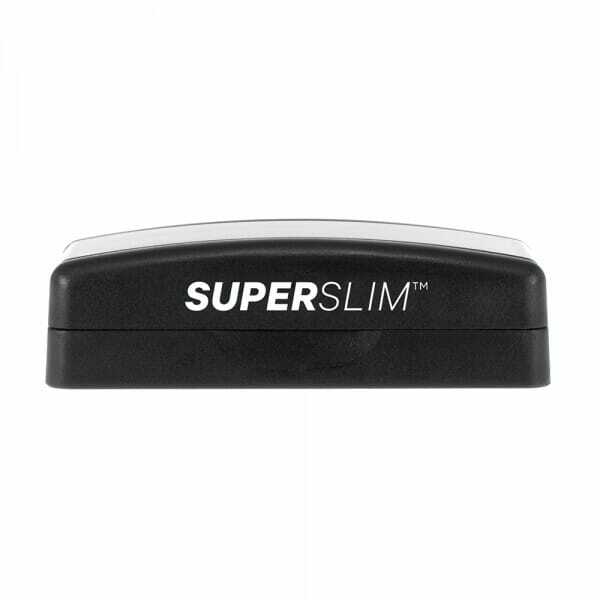 The Super Slim is the thinnest stamp in the market and fits easily in your pocket, and the closing cap keeps the ink where it belongs--on the stamp! Perfect for a name and address stamp, three line, or for your short custom message. You can upload your own logo or artwork in our stamp wizard! The Super Slim stamps use a low emissions manufacturing process with no added chemicals. Customer evaluation for "Super Slim 2564 7/8" x 2-3/8" - up to 4 lines"